Berlinica Blog: Advent, Advent —Here is Your St. Nikolaus Present From Berlin! Advent, Advent —Here is Your St. Nikolaus Present From Berlin! Advent, Advent! Are you still wondering how you can stuff your loved one's stockings, when St. Nikolaus comes, with Krampus in tow? Sure, there is that piece of coal Krampus will, or also, a bar of chocolate that comes with St. Nicolaus. 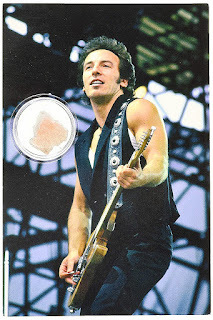 But if you need something really special—and something from Berlin—here is your Bruce Springsteen, Berlin Wall postcard: A picture of Springsteen himself, giving his famed concert in 1988 East Berlin with an authentic piece of the Berlin Wall attached! How do I know it is authentic? Those cards were manufactured in a Berlin location in Tegel, the part of town where the airport is located. The family that runs the plant has managed to secure a whole bunch of former Wall slabs, and they were huge! Tons of concrete! They have cut them down to tiny (and not so tiny) pieces, and are putting them up for sale. Yes, I have visited the factury and have seen the making of the cards myself! So, what are you waiting for?